“American Gangster” is a refreshing take on the cinematic world of New York mobsters. Ridley Scott is certainly more than comfortable with action, but his film is heavy on character and procedure and low on action. The film works best as an enlightening essay on the economics of drugs and how well it adapts into American big business. I really liked the American Gangster but I had my doubts. I thought Russell Crowe would be better off playing bad guy and Denzel Washington would be better off playing a good guy. However, it wouldn't have worked in this case. So when I saw it, I didn't have high hopes. I loved it though. 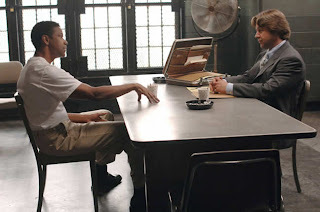 I have been listening to the Bible Experience where Denzel reads with his wife Pauletta from Song of Songs, the most romantic part of the Bible and I could only see Frank Lucas when I watched the movie. I didn't see the nice, sensitive guy Denzel. Anyway, here's another video clip of Denzel. http://zondervan.blogspot.com/ Check it out. Are commenters allowed to include spoilers? I agree with everything you say about the movie, except that I found the ending jarring and sentimentalized. Lucas sold out a lot of corrupt people to have his jail sentence reduced, and the movie presents that as heroic. That's not heroic, it's selfish. If Lucas did something to help others in his life, fine, show it. But after showing how heroin destroys people's lives, the movie tries to redeem Frank Lucas. I thought it was unconvincing and, frankly, repugnant. But until then I thought the movie was great. I don't think the ending makes Lucas out to be a hero. Its consistent with his character throughout the film - he's a smart man who knows how to survive - if it's selling out everyone he knew, then so be it. Lucas is still a sickening person who sold heroin to kids in his own neighbour. i don't think Ridley Scott condones that. The ending is an anti-ending because Lucas almost gets off scott free (no pun intended), and its the cop who chased him down (Crowe) that allows it. So I guess this reveals Robert's (Crowe) motivations - not to put Lucas behind bars, but to expose the corruption of the 'legitimate' people around him.